Therefore, a cold fall is caused by global warming. If, however, you happen to find yourself trapped in conversation with one of those simpletons who continue to deny the settled science of climate-change-in-absolutely-any-direction-may-only-be-explained-according-to-the-causal-paradigm-that-used-to-be-used-to-prove-that-winters-were-a-thing-of-the-past-but-is-now-to-be-used-to-prove-that-winters-will-become-more-fierce-than-ever-unless-and-until-winters-suddenly-seem-not-to-be-so-dang-cold-anymore-at-which-time-we’ll-go-back-to-calling-the-paradigm-global-warming-and-pretend-those-warmer-winters-were-exactly-what-we-had-predicted-all-along (or cciaadmobeattcptutbutptwwatotpbintbut-ptwwbmfteuauwssntbsdcaawtwgbtctpgwapt-wwwewwhpaa for short), and you cannot simply dismiss the denier in the usual way, namely by calling him/her a racist, a homophobe, an anti-science knuckle-dragger, or a hate criminal, then I suggest you refer said denier to the above photographic evidence. The birds begin to feel silly walking around on ice rather than swimming in water, and this stigmatizing awkwardness — a violation of their transportational self-identity — constituting metaphorical violence against their persons, leads to their metaphorical deaths. 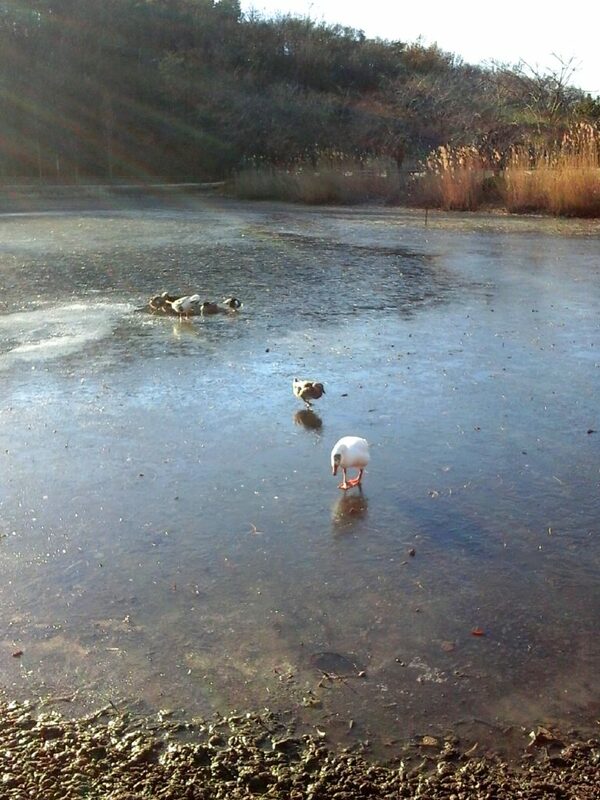 The goose in the foreground sees zir reflection in the ice, causing zir to realize that ze is not an ugly duckling — thus violating zir chosen species identity — and therefore ze metaphorically dies of systemic oppression. The birds, to avoid outcome 1, above, try to engage in their natural activity of swimming in a pond rendered unswimmable by the effects of cciaadmobeattcptutbutptwwatotpbintbut-ptwwbmfteuauwssntbsdcaawtwgbtctpgwapt-wwwewwhpaa, and consequently freeze their bums off. If the denier you are confronting is not silenced by these arguments, then there is no hope of him/her listening to reason, and you have no recourse but to revert to Plan A: Call him/her a racist, a homophobe, an anti-science knuckle-dragger, or a hate criminal.